Yes, I have been away and I am sorry that I just disappeared without announcing it. I am on March break, and recently returned from Nashville, Tennessee where I saw one of my oldest, dearest friends get married. I did bring my own food to the wedding reception, but only because I heard that prime rib was going the main attraction at dinner, and we all know I can’t survive on cake. Since I have two weeks of my March break remaining (yes, being a teacher has incredible perks) I am now off to a slightly more exotic locale: Marrakech, Morocco. I have never been to that part of the world before, and after this long, gray winter we’ve had, I’m craving some sort of sensory assault: bright colours, warm air and delicious food. It should be quite an adventure. Like the title says, healthy travel can be tough, but it doesn’t have to be. This month has proven that with a little preparation, any excursion, whether it’s a quick road trip or a journey halfway around the world, can be executed with nutritious flair. The easiest way to maintain good health while in transit is to bring your own food (obviously). This will allow you to sail past all those fast-food joints, saving you time, money and indigestion. I like to take along some of my favorite healthy snacks – easy to fit in a carry-on or in my purse – like brown rice crackers, almonds, dried fruit, high quality meal replacement bars (see recipe below), fresh cut veggies, etc. I also bring all my supplements with me. I drink plenty of bottled water and get more if I need it. I also try to have a full healthy breakfast before leaving home, as well as when I leave my hotel to come back. * Load up on fresh-cut vegetables and fruit. Carrot, red pepper and celery sticks and great because they will stay crispy for at least 12 hours. * Bring plenty of water. It will keep you hydrated and full so you don’t sip on sugary sodas. * Bring baked whole grain crackers and a mini bag of cereal along on your trip. This is good for added fiber and nutrients. * Don’t overindulge in greasy chips or sugary desserts. They offer nothing in the way of nutrition and can make you feel sluggish and foggy – a bad combination when you’re on vacation. * You can also pack sandwiches made with whole grain bread and peanut butter or spreads like hummus. * Nuts such as almonds, cashews, and walnuts contain polyunsaturated fats and are easy to take on a trip in either individual bags or larger containers. These last forever, just remember to soak them! And, before I even arrive at my final destination, I make sure I know where the nearest health food store is, just in case the local restaurants don’t measure up. I can always find the best ingredients to throw together a tasty sandwich if need be. 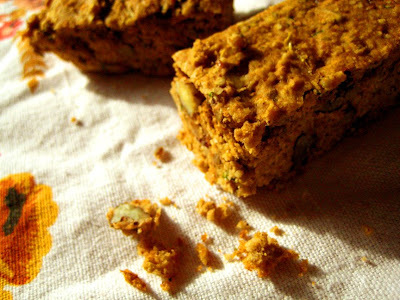 One thing I really like taking on trips are these “Everything Bars” (recipe from Enlightened Eating). They’re fully loaded with fruit, vegetables, legumes, whole grains, nuts and seeds. Satisfying as a snack, or a mini-meal on the go, you can make a whole bunch (the recipe can be doubled) and freeze them for your next road-trip or overseas adventure. 1. Preheat oven to 325 degrees F. Lightly oil an 8” x 10” pan. 2. In a large bowl mix together amaranth and buckwheat flour, quinoa flakes, nuts, seeds, baking soda, spices and salt. 3. In a blender or food processor combine chickpeas, milk, banana, oil, tahini, sweetener and vanilla. Pour into the flour mixture and stir to combine. Add grated vegetables and dried fruit. 4. Pour batter (which will be thick) into prepared pan and bake until set, approximately 35-40 minutes. 5. Let cool and slice into 12-16 bars. So I am off to Morocco for the next couple weeks and promise to have quite an entry when I return. The food adventure that awaits me will no doubt be unforgettable and I can’t wait to share all of my tasty travel experiences with you. All the best! I try to travel with a bunch of stuff, too. I definitely need to look for fermented to foods when I travel – I know they exist but can’t always find them when I need them. I know how to make kimchi, but maybe not well enough to produce it well on a consistent basis yet. I think it’s one of the things that I’m missing most when I travel usually. Also, I try to travel with a good sauce pan. Many places have a kitchen but don’t really have good quality cooking-ware. I’ve tried both stainless-steel and iron and I think stainless-steel makes more sense all-round, travel-wise. my greatest thanks to you! one of my children LOVES bread, crackers etc. but grains hurt his tummy. i’ve tried so many recipes to feed his need but he hasn’t liked any of them. but this one is truly a hit. he LOVES it!! LOVES IT!! all of my kids do and i do too. thanks for taking the time to post it. so healthy and sooo yummy and no one’s tummy hurts after, not even after eating half the recipe! you really helped a mom out! I stumbled upon these while looking through your site today. I’d really like to try them. Thinking of a suitable substitute for amaranth flour as I’m on a budget. Would corn meal or oat flour work? Yeah, rolled oats would be fine – just make sure they are gluten-free oats if that is something you want. Do you think I could substitute rolled oats for the quinoa flakes? Or anything else you suggest? Cooked quinoa? mmmmmmm. 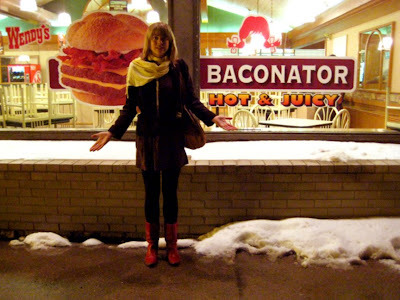 you and the baconator- two of my favourite things in the whole world together at last! I made the “everything bars” Sarah, they are great and SO easy to pack for the road.